Burnham-on-Crouch is a town and civil parish in the Maldon District of Essex in the East of England. It lies on the north bank of the River Crouch. It is one of Britain's leading places for yachting. The civil parish extends 5 miles (8 km) east of the town to the mouth of the River Crouch. It includes the hamlets of Creeksea and Ostend west of the town, Stoneyhills to the north and Dammer Wick, West Wick and East Wick east of the town. According to the Domesday Survey of 1086, Burnham was held in 1066 by a thegn called Alward and 10 free men. After 1066 it was acquired by a Norman called Tedric Pointel of Coggeshall whose overlord was Ralph Baynard. Historically, it has benefited from its location on the coast – first as a ferry port,:119 later as a fishing port known for its oyster beds, and most recently as a centre for yachting. :132 There are many listed buildings in the town, including the Grade II* listed Royal Corinthian Yacht Club designed in 1931 by the modernist architect Joseph Emberton. The Mangapps Railway Museum is located nearby. Although the town has a population of little over 7,500, it is the principal settlement in the wider Dengie peninsula area (population 20,000), meaning it has facilities that are uncommon in small towns, such as a cinema, a laundrette, a post office, 22 licensed drinking establishments and three pharmacies. Burnham played a significant role in both world wars. A First World War airfield was established in 1915 on agricultural land next to present day Wick Farm. It was used until early 1919. It was established for use by Home Defence aircraft in order to defend against Zeppelin attack and as a night flight station. The small grass landing field covered an area of about 150 acres. There were no permanent buildings, and the personnel were billeted in tented accommodation. The base was initially established by the Royal Navy Air Service (RNAS) and two Bristol T.B.8s operated from there. The Royal Flying Corps (RFC) took over responsibilities for Home Defence in 1916 and the airfield became a RFC base operating BE type aircraft of 37 Squadron (50th Wing). The airfield was closed in 1919. During the Second World War, Burnham was the training base for one of the first Commando battalions, led by Lt-Col Dunford-Slater. From 1943 to 1945 it was HMS St Matthew, base for up to 1400 sailors training on minor landing craft. The navy occupied the Royal Corinthian Yacht Club and a site at Creeksea. Unconnected with these activities, the area often witnessed Luftwaffe crashes and bomb, mine and V-weapon explosions--German parachute mines caused fatalities in the town and at nearby Southminster. Since 1966 Burnham-on-Crouch has had an RNLI lifeboat presence. Initially it operated only during the sailing season, but from 1987 it has done so all year. The on-shore facilities are in the marina with two floating boathouses in Burnham yacht harbour. The town has two community-based magazines, the larger of the two is The Burnham on Crouch and Dengie Focus which is delivered to every house and business in Burnham and Southminster and can be picked up from collection points throughout Dengie. The other is The Burnham and Dengie Hundred Review, which is a smaller A5 size and is delivered free across the Dengie. On the last Saturday of September, the town holds its Illuminated Carnival, which was held for the 100th year in 2008. The carnival takes place on the High Street and Quay with stalls, sideshows and displays, and culminates with a grand illuminated procession in the evening, which leaves from the clock tower and proceeds around the town. There is also a fancy-dress competition for children. The carnival is sponsored by local businesses. The Essex town was mentioned in the song "Billericay Dickie", by Ian Dury. This song alludes to Burnham's somewhat upmarket status in the county. In view of the town's comparatively isolated position – 20 miles from Chelmsford. the nearest large town – Burnham-on-Crouch railway station represents a vital transport link. The station is situated on a single-line branch from Wickford, which escaped closure in the 1960s by Beeching, as it was used to supply the nearby Bradwell nuclear power station. The branch line was electrified in the 1980s, and provides off-peak services to Wickford with direct services to and from London Liverpool Street during rush hour, thus allowing the town's inclusion in the London commuter belt. The town also has several frequent bus links that travel to Chelmsford. Operated by First Essex, frequent services include the 31X/31B linking Burnham On Crouch - Latchingdon - Maldon - Danbury - Chelmsford, and the 31C/31 buses which sometimes travel through Maldon to Chelmsford. Fords Coaches, Arrow Taxi and Stephensons of Essex also offer various bus services. Burnham-on-Crouch hosts an annual sailing event known as Burnham Week, which takes place in the last week of August. The week includes competitive yacht and dinghy racing on the River Crouch. The event is shared among the four established sailing clubs in Burnham: The Royal Corinthian Yacht Club (linked to the sailing club with the same name in Cowes, Isle of Wight), The Royal Burnham Yacht Club, The Crouch Yacht Club, and The Burnham Sailing Club. Burnham-on-Crouch has a non-league football club Burnham Ramblers F.C., which plays at Leslie Fields. There are rugby union, cricket and lawn bowls clubs, all of which compete at local, county and regional levels. Burnham Golf Club, an 18-hole course, is at Creeksea, approximately 1.5 miles from the town centre. Keith Musto, received a silver medal for sailing in the Tokyo 1964 Olympics and was the founder of Musto clothing company. ^ "Town population 2011". Retrieved 22 September 2015. ^ a b Stuart Fisher (5 January 2012). Rivers of Britain: Estuaries, tideways, havens, lochs, firths and kyles. Bloomsbury Publishing. pp. 210–. ISBN 978-1-4081-5583-7. Retrieved 1 August 2012. ^ a b c M.P.B. Fautley; J.H. Garon (1 July 2004). Essex Coastline: Then and Now. Matthew Fautley. pp. 119–132. ISBN 978-0-9548010-0-7. Retrieved 1 August 2012. ^ World fishing. IPC Industrial Press. 1973. Retrieved 1 August 2012. ^ David St John Thomas (29 July 2010). Remote Britain. frances lincoln ltd. pp. 495–. ISBN 978-0-7112-3054-5. Retrieved 1 August 2012. ^ Peter Ashley (26 April 2011). Cross Country: English Buildings and Landscape From Countryside to Coast. John Wiley & Sons. pp. 146–. ISBN 978-0-470-68611-9. ^ Institute of Health Service Administrators (1974). The Hospitals & health services year book and directory of hospital suppliers. Institute of Health Service Administrators. ISBN 978-0-901003-09-6. ^ ADM 199, DEFE 1 and Ho 192/193 files National Archive, CW 1 series files at Essex County Record Office, J P Foynes "Battle of the East Coast 1939-1945"
^ "About us – Burnham Lifeboat". www.burnham-rnli.org. Retrieved 17 April 2018. ^ "Burnham has a big celebration". Essex Life. Archant. September 2008. p. 16. Retrieved 18 January 2009. (Registration required). 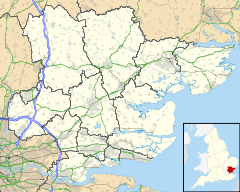 Wikimedia Commons has media related to Burnham-on-Crouch. This page was last edited on 20 April 2019, at 23:19 (UTC).